The Big 12 will have a new look in 2011 with two fewer teams and one fewer championship game. However, before we bring the curtain down on the old Big 12, let's take one last look at this past season with SDPI. For a primer, here's the link to last year's SDPI post on the Big 12. As usual, this first paragraph will explain how SDPI is calculated. So if you want the meat of this article skip on down. In the 2010 Big 12 regular season, conference play only, championship game excluded, the average Big 12 team gained and allowed 3256.25 yards. The standard deviation for yards gained (offense) was 616.65 yards. The standard deviation for yards allowed (defense) was 506.61 yards. Colorado gained 2923 yards and allowed 3453 yards. Their offensive SDPI was -0.54 = [(2923-3256.25)/616.65]. Their defensive SDPI was -0.39 = [(3256.25-3453)/506.61]. Their total SDPI was -0.93. This number ranked 9th in the Big 12. Here are the 2010 Big 12 standings. 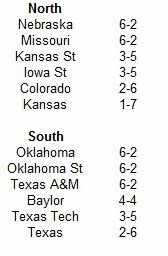 Now here are the 2010 Big 12 SDPI standings. The standings are sorted by division by total SDPI with ranking for each category (out of 12 teams) in parentheses. At the top of the standings the 2010 season played out according to the SDPI ratings. The top-ranked team from the North Division (Nebraska) met the top-ranked team from the South Division (Oklahoma), with the top-ranked overall team (Oklahoma) emerging victorious. Elsewhere in Big 12 land, the Longhorns, Big 12 Champions and BCS National Championship Game participants in 2009, failed to qualify for the postseason, suffering their first losing record since 1997. This one is pretty easy to answer. Despite their 2-6 conference record, and cellar finish in the Big 12 South, Texas was actually a solid team on a down-to-down basis. Behind defensive coordinator Will Muschamp (now the head man at Florida), the Longhorns remained stout on the defensive side of the ball, ranking behind only Nebraska for top honors in the Big 12. The offense understandably suffered a decline with the loss of Colt McCoy and Jordan Shipley, but was just a shade below average. All things being equal, a 5-3, or at worse 4-4 league record should have been expected. 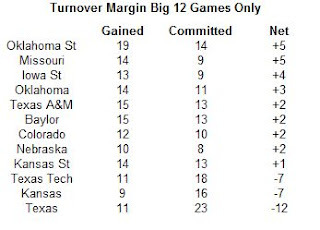 However, the Longhorns turnover margin hampered any chance they had of competing in the Big 12 South. The Longhorns forced fewer turnovers (11) than all but two Big 12 teams, and they committed the most turnovers (23) by far of any team. Quarterback Garrett Gilbert was mostly to blame, throwing 16 interceptions in eight league games. However, going forward Gilbert has the recruiting pedigree to be a star, and lets not forget his predecessor, Mr. McCoy, also had a bit of an interception problem as a sophomore. Outside of Texas, there wasn't a great deal of disconnect between the actual standings and the SDPI ratings, but Missouri's underlying performance was not quite as strong as their division title (share) would indicate. The Tigers were a little below average on offense (hard to believe after their record breaking years under Chase Daniel) and above average on defense, making them a little better than average overall. The Tigers appeared to falter down the stretch (outside of their finale against an awful Kansas team) which brought their overall rating down. Through their first three games league games they outgained their league foes (including South Division co-champs Texas A&M and Oklahoma) by 52 yards per game. In their next four games (before their throttling of Kansas), the Tigers were outgained by 53 yards per contest. In his first year as offensive coordinator for the Cowboys, Dana Holgorsen helped lead the Cowboys to a share of the Big 12 South title when most of the preseason prognosticators had called for a last place finish. You'll see him coordinating the West Virginia offense in 2011 and then in the head man's chair in 2012. 2007 is officially ancient history. In Turner Gill's first season, the Jayhawks were held below 300 yards in five of their eight league games. They did somehow manage to roll up 453 yards in their lone win over Colorado. However, just to show they didn't want to raise expectations heading into 2011, they gained 87 yards the next week versus Nebraska. Bo Pelini does it again. In his three seasons as the Nebraska coach, the Cornhuskers have finished second, second, and first in the Big 12 in defense. The year before he arrived, they were dead last. Yep 2007 is ancient history. 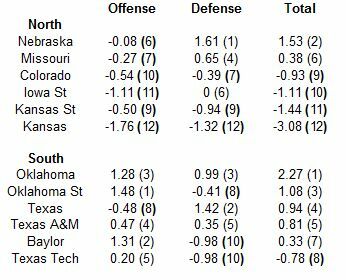 if you're looking for bright spots, the Jayhawks performed much better in games against their division rivals in the North (426 yards per game allowed) than they did against teams from the South (599 yards per game allowed). Texas Tech: Is the Offense Passing Away? Mike Leach did several things during his decade-long run as head coach at Texas Tech. His teams always put up eye-popping offensive numbers, he presided over the most consistent run of success in Texas Tech history, and he may have locked Adam James in a shed. That last lapse in judgment got him fired, but what does it mean for the Texas Tech program? One year after his ouster, the program appears to have taken a step back. This past year, the Red Raiders posted their first losing season in Big 12 play since 2000, and for the first time since I have been calculating SDPI numbers (2005), the offense did not rank either first or second in the Big 12. In fact at just 0.20 standard deviations above average, the offense was about as un-Leach, at least in results, if not input as it could possibly be. Of course, a precursory glance at the numbers could tell you the offense declined, but exactly how much did it decline in relation to the rest of the conference? To answer this question, I looked at the passing numbers posted by Texas Tech in Big 12 play only for the past five seasons. The raw numbers as well as Tech's rank in the Big 12 in three key passing categories (completion percentage, yards per pass attempt, and passer rating) are included in the table below. The Red Raiders not only declined in raw statistics, but also in their rank within the conference. This decline was also across the board. After ranking either first or second in completion percentage in the conference in each of Leach's last four seasons, the Red Raiders fell to fifth in 2010. An even further descent occurred in yards per pass, where the Red Raiders fell to ninth and passer rating where they fell to eighth. Not only did the Red Raiders decline in every significant passing category, but outside of completion percentage, they were below average throwing the football! Head coach Tommy Tuberville and offensive coordinator Neal Brown did have the excuse that the system, while not new, was at least somewhat different from what Leach ran. However, they did not have the excuse that the personnel was different. Quarterback Taylor Potts was a senior who threw nearly 500 passes as a junior in 2009. In addition, their top-five receivers from 2009 all returned for duty in 2010. The Red Raiders do not have that luxury in 2011. Taylor Potts has exhausted his eligibility as have last season's top-two receivers, Lyle Leong and Detron Lewis. With that attrition on offense, the Red Raiders may fade further into the offensive abyss in the Big 12.